10% off each meal purchased on our extended openings Thursday, Friday and Saturday nights. Go to the bottom of the page ot claim this offer! 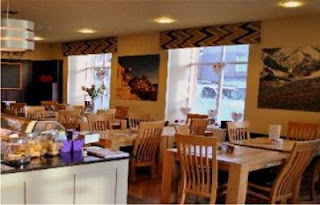 Tomlinson’s café serves wholesome, hearty breakfasts, lunches and light evening meals. A warm welcome is extended to non residents as well as our Bunkhouse guests. Homemade from local, in-season produce wherever possible, our menu gives visitors a delicious taste of Northumberland.Set in the heart of Northumberland hill farming country, we are surrounded by some of the best livestock producers in the UK and are close to the coast with its delicious haul of seafood fresh from the North Sea.Free wireless internet in the café mean you don’t have to be cut off from the outside world during your visit, unless of course you want to be.Our café is central to Tomlinson’s unique role in Rothbury as a facility for both visitors and the local community to use and enjoy.